Part 2 of a series on Canine Cognition: Object/word memory. Chaser (above) as presented by John W. Pilley, Ph.D.
At the APA Convention 2 years ago I attended a popular presentation by Dr. Stanley Coren, where he shared a great deal of historic research, referencing cognitive processing models and developmental (human) notions such as "object constancy" and other concepts from Piaget and learning theory, along with some slides from experiments and some engaging video clips of some talented dogs (including a border collie on a skate board). Coren also traced the role of genetics (breeding) and compared different breeds. Today's presentation was focused on one particular set of memory and reasoning skills and centered on one very talented border collie in particular: Chaser. And .... Chaser was there too (above), although she did not "perform" live. Instead, her incredible skills were presented through numerous video clips (home-made, mostly). As Dr. Pilley noted at the very beginning, "Obviously people love dogs". This was a fun event; one could watch in awe and be appreciative of Chaser's cleverness and memory skills (seemingly well beyond some humans!) as well as coming away more informed about border collies. Dog lovers in general were definitely enjoying the behavior, demeanor, and "intelligence" of Chaser. And clearly both dog and owner are devoted to each other. Dr. Pilley first referenced Kaminsky's 2002 report on Rico, who could learn over 200 names of objects. A key finding, which placed Rico's learning apart from simply recognizing a few commands and object names, was how he learned by exclusion. "Exclusion learning does not depend on associative factors. It requires a higher cognitive level." Research into children's language acquisition posits that young children acquire "referential understanding" when they reach the stage of knowing that objects have names - and they're taught with cues." One researcher (Markman) was not convinced it was so simple; for example, 2 words might (in the beholder's mind) perhaps be combined into one morpheme (sound byte) and that could be learned as one entity rather than having learned 2 separate words and their meanings. In any case, Dr. Pilley's own extensive research with Chaser "confirmed the findings of the Kaminsky team" - namely of learning through exclusion. There were ooh's and ahh's among the dog-loving audience, as Dr. Pilley showed some home videos of "Chaser and Papa". He recalled what the breeder told him when he first adopted Chaser: "If you give your heart she will give you her mind." Clearly they struck that deal! -- Experiment 1 "demonstrated Chaser's ability to learn a proper-noun name of over 1000 objects." -- Experiment 2 "demonstrated that two word commands like 'fetch ball' were independent - that both the verb and noun had semantic meaning." -- Experiment 3 "demonstrated Chaser's ability to learn common nouns - words that represent categories, such as ball, frisbee, and toy." -- Experiment 4 demonstrated Chaser's ability to learn words by means of exclusion - inferring the name of an object based on its novelty among familiar objects that already had names." Dr. Pilley presented his criterion for learning, which consisted of 8 consecutive trials where Chaser had to correctly identify a series of named objects. In this study, if Chaser failed any one of the 8 trials, she started over again and was given additional training until the criterion was met. In the end, statistically significant findings were obtained in all 4 experiments. 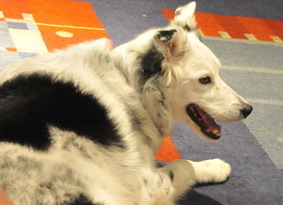 [Slide of Chaser in the family room in the typical border collie stance, and with fixed gaze.] "They can assume this stance for a long time." Next we saw Chaser herding sheep, as taught by Pilley: "Bring her here girl. Good Girl!" Chaser at times now will "herd a toy - as a surrogate". Video clips showed Chaser performing more and more complex tasks, including 2 and 3-step commands :"Drop, drop... Back-stand-stay". Then, standing in the classic stance, she responds to 1... 2... 3.... (waiting still), Go! The training and research began when Chaser was only 5 months of age. Pilley assessed her memory of toys every month for 30+ weeks. He made up names for the dolls, plush animals, and other toys until he had accumulated over 1000 toys, in 16 large Tupperware tubs. Did she really learn the name of every toy? "Yes, with 95% success." Chaser began to accumulate accolades such as "world's smartest dog", and was widely cited as having a documented vocabulary of 1022 words. This captured media attention, as well as numerous online clips (Youtube, etc.) Pilley next showed a "more professional" documentary of sorts, which you can see a versions of below, as presented on ABC News, Feb.9, 2011. (Titled, aptly, "An Amazing Dog"). Finally, Dr. Pilley ended with some more home videos, with Chaser following multi-step commands, beyond simply finding and fetching, such as get/bring/paw, nose on ABC, and even responding to the cue of a bird sound.